Meigs junior Kassidy Betzing (30) shoots a jump shot in between Lady Raiders Savannah Reese (15) and Kaylee Tucker (23), during the first half of the Lady Marauders’ 70-24 victory on Thursday in Rocksprings, Ohio. ROCKSPRINGS, Ohio — Momentum works both ways. 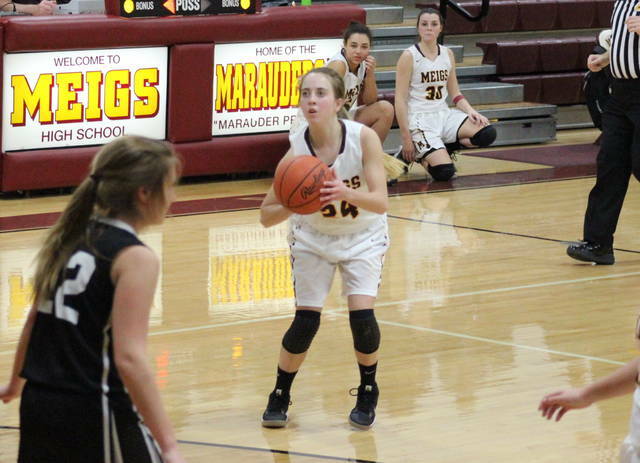 The Meigs girls basketball team picked up its third straight victory on Thursday evening in Larry R. Morrison Gymnasium, defeating Tri-Valley Conference Ohio Division guest River Valley by a 70-24 count, giving the Lady Raiders their sixth straight setback. The Lady Marauders (4-2, 3-0 TVC Ohio) never trailed in the game, with the only tie of the night coming at 2-all. After back-to-back three-pointers by MHS, the Lady Raiders (0-6, 0-2) went on a 6-to-5 run and trailed 13-8 with two minutes left in the stanza. However, the Maroon and Gold ended the period with eight unanswered points and a 21-8 advantage. 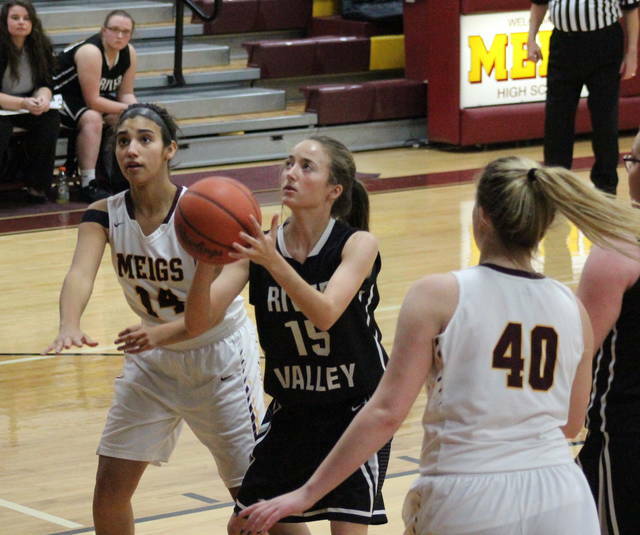 RVHS scored the opening basket of the second quarter, but Meigs claimed the next 17 points and led by 28 points with two minutes left in the half. MHS outscored its guest by a 4-2 count over the final two minutes of the period and headed into the break with a 42-12 advantage. The Maroon and Gold scored the first nine points of the second half and ultimately led 56-14 at the conclusion of the third quarter. 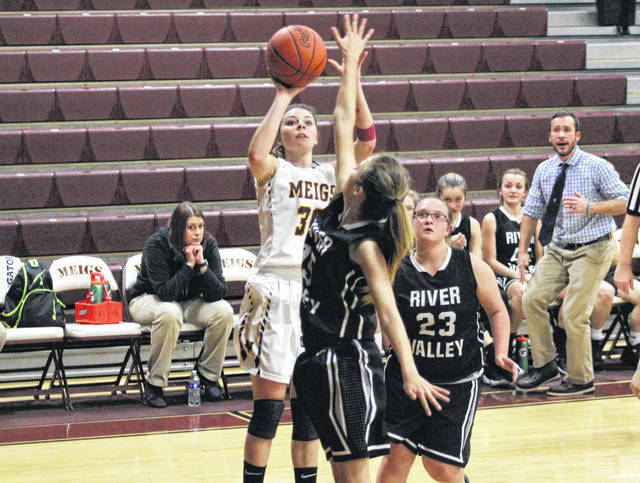 Over the final eight minutes, Meigs outscored RVHS by a 14-to-10 count, with the hosts sinking nine free throws in the period to help seal the 70-24 win. For the game, Meigs shot 21-of-60 (35 percent) from the field, including 9-of-25 (36 percent) from beyond the arc. Meanwhile, River Valley shot 10-of-41 (24.4 percent) from the field, including 0-of-9 from three-point range. From the free throw line, the Lady Marauders were 19-of-33 (57.6 percent) and the Lady Raiders were 4-of-15 (26.7 percent). As a team, the Lady Marauders claimed a 37-to-34 rebounding edge, including 16-to-10 on the offensive glass. MHS also held advantages of 16-to-5 in assists, 24-to-7 in steals and 3-to-2 in blocked shots. The hosts committed 12 turnovers, while RVHS gave the ball away 30 times. “We’ll get better, it’s going to be a process,” said Roderick. “They’re not really used to getting open, so when they do get an open look it’s almost like panic sets in. We just have to get comfortable, because in these first few games we’ve rushed and we’ve been pushed so hard, that we’ve never been under control. Now they’re getting better at some things where they can get looks, but they panic and they don’t shoot like they know how to. The Lady Marauders were led by junior Kassidy Betzing with 20 points, 16 of which came in the first half. Marissa Noble was next for MHS with 11 points, followed by Bre Lilly with 10, all of which came in the finale. Devin Humphreys scored seven points in the win, Alyssa Smith, Madison Fields and Becca Pullins added six points apiece, while Jacynda Glover marked three and Taylor Swartz posted one. Noble had a game-high three trifectas for the victors, Pullins and Humphreys both made a pair of three-pointers, while Lilly and Betzing both made one from beyond the arc. Humphreys led the hosts on the glass with six rebounds, followed by Fields and Jerrica Smith with five each. Maddie Hendricks dished out a game-high four assists for the Lady Marauders, while Betzing and Pullins came up with five steals apiece. Noble, Humphreys and Pullins each rejected a shot in the win. 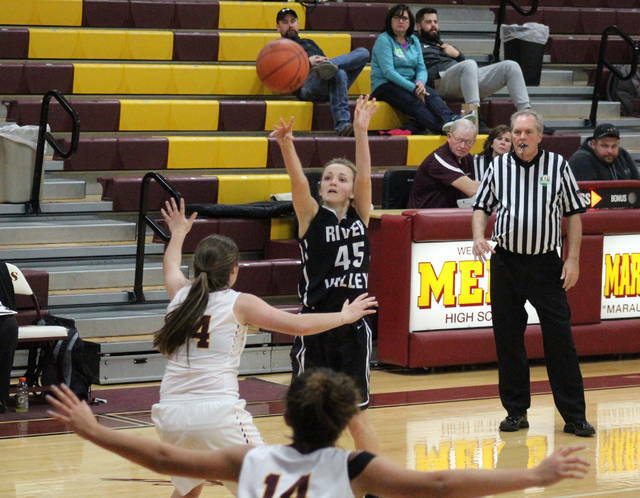 RVHS sophomore Kaylee Gillman had eight points to lead the Silver and Black. Next was Savannah Reese with five points and Beth Gillman with four. Kelsey Brown, Carly Gilmore and Jaden Neal had two points apiece in the setback, while Kaylee Tucker had one marker. Hannah Jacks pulled in a game-high nine rebounds to lead the guests on the glass, while Brown came down with seven boards. Beth Gillman recorded a team-best two assists, Jacks led the team with four steals, while Beth Gillman and Kaylee Gillman rejected one shot each. RVHS and Meigs will face for the second time this winter on Jan. 25 in Bidwell. The Lady Marauders will continue their league schedule on Monday at Alexander. “Next week is huge for us,” Kasun said. “We’re at Alexander and that’s always a tough place. I don’t know the last time we beat Alexander, so we’re going to go in there hard, and focus on them all weekend. After that we have we have Vinton County coming in on Thursday, so it’s going to be a tell-tale week for the TVC Ohio Division. After hosting South Gallia on Saturday, the Silver and Black will get back to TVC Ohio play on Monday at Athens.